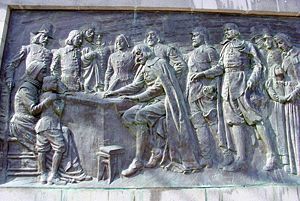 This bas-relief depicting the signing of the Mayflower Compact is on Bradford Street in Provincetown, Massachusetts on the base of the the Pilgrim Monument. The Mayflower Compact was the first governing document of Plymouth Colony, drafted by English religious separatists known as the Pilgrim Fathers aboard the Mayflower in 1620. With the charter for the colony incomplete at the time the colonists departed England, the Pilgrims arrived off the coast of New England without a patent. The colony thus had no legal basis, and some non-Pilgrim passengers suggested that the settlers were free to ignore the apparently ambiguous authority of Governor John Carver, as well as their contract with the colony's investors. In response to certain "mutinous speeches," a brief contract was signed on November 11, 1620, promising cooperation among the settlers "for the general good of the Colony unto which we promise all due submission and obedience." In establishing a governing authority, the Pilgrims turned to the model of their own congregational churches as the basis of government. The colonists would form a "body politic" which would select leaders chosen by the majority, just as separatist congregations had elected their own ministers and governed themselves. The document was ratified by majority rule, with 41 adult male passengers signing. Many historians regard the document as the forerunner of the United States Declaration of Independence and of the United States Constitution. From its inception on the Mayflower, the idea of self-government based on a social contract would expand in New England town meetings and traditions of local government, and later would influence the establishment of American republican government. John Quincy Adams described the Compact as "the only instance in human history of that positive, original social compact" which he and others took to be the "only legitimate source for government"
Bradford's transcription of the compact. 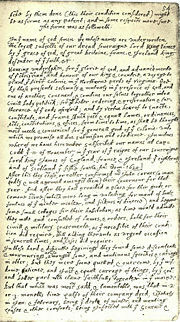 The Mayflower Compact was signed on November 11, 1620, (O.S.) in what is now Provincetown Harbor near Cape Cod. The Pilgrim Fathers used the Julian Calendar which, at that time, was ten days behind the Gregorian Calendar, signing the covenant "ye .11. of November" (literal). Having landed at Plymouth (so named by Captain John Smith earlier), many of the Pilgrims aboard realized that they were in land uncharted by the London Company. For this reason the Mayflower Compact was written and adopted, based simultaneously upon a majoritarian model and the settlers' allegiance to the king. The Mayflower carried 102 passengers. Of these, 41 were Pilgrims seeking a new environment where they could practice their religion in the manner they chose. The remainder of the passengers, called "Strangers"by the Pilgrims, included merchants, craftsmen, skilled workers and indentured servants, and several young orphans. William Brewster and other Pilgrim leaders organized the voyage and gathered these “strangers” to increase the chances of the colony's success. The voyage lasted more than two months. When they finally sighted land the captain of the Mayflower knew right away that they were far north of their destination so headed southward. This proved too dangerous and they were forced to turn back and drop anchor in a harbor at the tip of Cape Cod. Unrest started immediately. William Bradford later wrote that several “strangers” made “discontented and mutinous speeches.” Bradford went on to explain that the “Strangers” did not want to follow rules because “none had power to command them.” The Pilgrim leaders, with staunch determination to establish a colony amidst the brewing rebellion, knew they needed a temporary government authority. In England, such authority came from the king but in remote America it could only come from the colonists themselves. 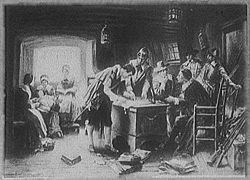 While still aboard the Mayflower, the Pilgrims and "Strangers" made a written agreement or compact among themselves. It is assumed that William Brewster, who had a university education, wrote the Mayflower Compact. The pattern of church self-government used by the Pilgrims to establish their Separatist churches in England and Holland served as a model for political self-government in the Mayflower Compact. Almost all the adult male colonists, including two of the indentured servants, signed the document. By signing the Mayflower Compact, the colonists in no way intended to declare their independence from England. The opening line of the Compact refers to both Pilgrims and "Strangers" as "loyal subjects" of King James. The document is very short. It simply united the signers into a "Civil Body Politic" for the purpose of passing "just and equal Laws…for the general good of the Colony." However, those few words conveyed the idea of self-government for the first time in the New World. From its crude beginning in Plymouth, the idea of self-government in New England evolved into town meetings and gradually spread into larger local governments in colonial America. The Mayflower Compact was all but forgotten by the time of the Constitutional Convention, but the idea of self-government was still powerful. Therefore, even though the Mayflower Compact was quickly written out of necessity, it set a historic precedent toward the creation of a new democratic nation. "In the name of God, Amen. We, whose names are underwritten, the loyal subjects of our dread sovereigne Lord, King James, by the grace of God, of Great Britaine, France, and Ireland king, defender of the faith, etc., having undertaken, for the glory of God, and advancement of the Christian faith, and honour of our king and country, a voyage to plant the first colony in the Northerne parts of Virginia, doe, by these presents, solemnly and mutually in the presence of God, and one another, covenant and combine ourselves together into a civil body politick, for our better ordering and preservation and furtherance of the ends aforesaid; and by virtue hereof to enacte, constitute, and frame such just and equall laws, ordinances, acts, constitutions, and offices, from time to time, as shall be thought most meete and convenient for the generall good of the Colonie unto which we promise all due submission and obedience. In witness whereof we have hereunder subscribed our names at Cap-Codd the 11. of November, in the year of the raigne of our sovereigne lord, King James, of England, France, and Ireland, the eighteenth, and of Scotland the fiftie-fourth. Anno. Dom. 1620." Haveing undertaken, for ye glorie of god, and advancemente of ye Christian faith and honour of our king & countrie, a voyage to plant ye first colonie in ye Northerne parts of Virginia Company, doe by these presents solemnly & mutualy in ye presence of God, and one of another, covenant & combine our selves togeather into a civill body politick, for our better ordering & preservation & furtherance of ye ends aforesaid; and by vertue hearof to enacte, constitute, and frame such just & equall lawes, ordinances, Acts, constitutions, & offices, from time to time, as shall be thought most meete & convenient for ye generall good of ye Colonie, unto which we promise all due submission and obedience. In witnes wherof we have hereunder subscribed our names at Cap-Codd ye •11• of November, in ye year of ye raigne of our soveraigne Lord King James, of Kingdom of England, France, & Ireland ye eighteenth, and of Kingdom of Scotland ye fiftie fourth. Ano: Dom. 1620. The compact is often referred to as the foundation of the US Constitution of the United States, in a figurative, not literal, way, although is often mistakenly thought to be the first Constitution in America. The Fundamental Orders of Connecticut actually hold this honor. Signing of the Mayflower Compact, a painting by Edward Percy Moran, which hangs at the Plymouth Museum. The list of 41 male passengers who signed was supplied by Bradford's nephew Nathaniel Morton in his 1669 New England's Memorial. There are no surviving first-hand accounts of this information. ↑ "The Mayflower Compact," Plymouth Plantation. The Mayflower Compact Retrieved January 13, 2008. ↑ State Library of Massachusetts Online catalog Retrieved January 13, 2008. ↑ Bradford, William (1898). "Book 2, Anno 1620", in Hildebrandt, Ted: Bradford's History "Of Plimoth Plantation" (PDF), Boston: Wright & Potter. Retrieved January 13, 2008. ↑ Adams, John Quincy (1802). in Manis, Jim: John Quincy Adams' Orations (PDF), Pennsylvania State University. Retrieved January 13, 2008. ↑ Morton, Nathaniel (1669). "2", in Rhys, Ernest: New England’s Memorial. Bibliomania. Retrieved January 13, 2008. Eliot, Charles William. American Historical Documents 1000-1904 With Introductions and Notes. The Harvard classics, v. 43. Whitefish, Mont. : Kessinger Publishing, 2004. Howe, Randy. Speak to Me Great American Texts Demystified for Today's Text-Messaging Students. New York: Kaplan, 2007. This page was last modified on 11 September 2018, at 16:23.